Global Ventures began in 2002 with the vision of taking everyday people to the lost and hurting around the world. Since then, we have taken more than a thousand people from all over North America on 64 mission trips to 24 different countries. During a Global Ventures trip, you will experience hands-on ministry through children’s outreaches, street evangelism, and crusades. You will also be a part of bringing hope and healing to various regions of the world as you venture into places where few others dare to go. In the evening crusades you will experience the power of God as people are saved, healed, set free, and many lives are forever changed. These trips are designed to not only take Jesus to the world, but also to reveal to you the true Heart of God as you fulfill the Great Commission with us. REGISTER NOW FOR OUR 2018 MISSION TRIPS! 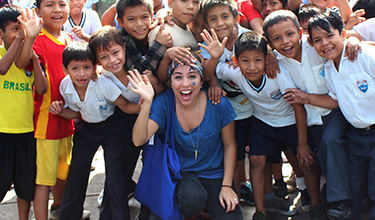 These trips are designed to expose churches, youth groups, families and everyday people to real missions. From parks to city streets, hospitals to marketplaces; you will encounter many people searching for hope. 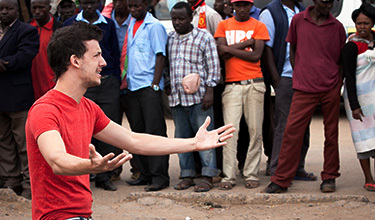 Illustrating the message of Christ through drama, you will preach the simple Gospel in a relevant way. You will also have the opportunity to lay your hands on the sick and see miracles manifest before your eyes! Enhance the lives of thousands of children overseas through colorful clowns, interactive games, and entertaining skits as you share the story of Jesus in the streets and schools. You will also experience a cutting-edge Kids Festival designed to captivate young hearts and teach them about a God who loves them unconditionally. In the evenings you will participate in a city-wide mass crusade where crowds gather, often by the thousands. Ministering from the stage, you will see darkness and hopelessness fade away from the lost as they hear the Truth their hearts have longed for. Excitement builds as the Power of the Living God is displayed in a tangible way. You will not be on the sidelines. We’ve designed our Global Ventures trips to impact entire regions of the world with the Gospel of Jesus Christ. Our goal is to expose you to the most destitute and unreached areas of the world so you can experience first-hand the joy of winning people to Christ. See miracles through your hands as you step out of your world and enter places where the Name of Jesus has never once been heard. Come with us and carry the light of the Gospel across the globe as you discover your true purpose and change others for eternity. From teenagers and young adults, to families with children, to retirees – we welcome a wide variety of people with us on Global Ventures trips. You will not have to eat bugs or sleep in a tent, but you will leave behind certain comforts, because we often go to remote areas that have never been exposed to the Gospel. We provide in-country transportation and hotel accommodations with air conditioning. You will also receive three meals a day, and plenty of water to keep you hydrated.